Thank you very much <3 How about the previous question, my dear? The one about crystals in Pearl Items? Why is there more annoying unremoveable UI? Please get rid of whatever this is. There's literally no good reason that should be on my screen right now. 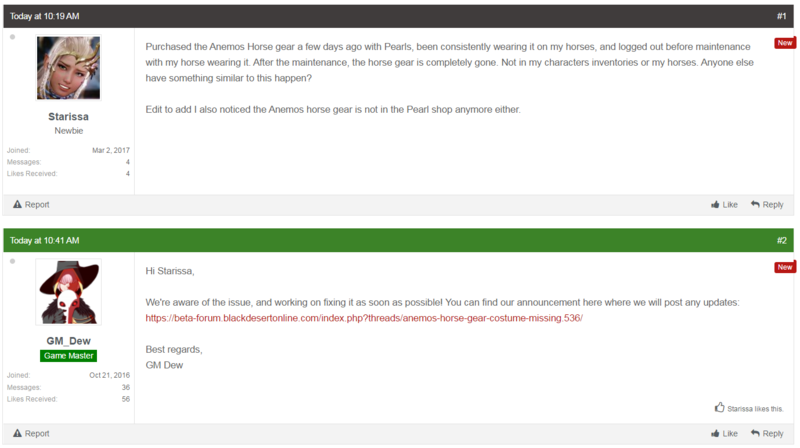 I'm not sure where to post this as it's probably too small for a ticket, but I'm panicking because the gorgeous Anemos horse gear has been removed from the pearl shop. I have my heart set on buying that gear whenever I have the money, and I didn't see any time limit on it the last time I tried it on...and it's just not in the pearl shop anymore. What's going on here? one would think an intregral skill of a class would be a priority fix much akin to say wiz/witch/tamers not being to summon/use pets at all. it's not even magically fixed without them even realising? Where is this new skill?? as if we needed more on Tamers. Thanks for making it harder to failstack. As if we didn't have hell already. Edit: Wait a moment... It means i can bid on different price ranges, or that i can buy item that aint in bid phase even if it is a bit more expensive? Be warned: this is the third time they've tried to add this. I haven't tried but holding my breath for it to be worth a damned isn't in my plans for tonight. "Challenges based on Sailing level have been added." Only the amount of items you need to use for repairs has changed. Use the durable option, the enhancing rates are the same as previous. Yo..Why are you Nerfing Tamers, That was unnecessary as hell. So... this is a big deal actually, are they actually able to be killed or are you just messing around with us? I have a slow understanding of things sometimes. So, was Reblath gear not effected by the enhance change or was it? EDIT: Nevermind, read the message above mine and understand it now. "Crystals will not be able to be infused on unbound Pearl Costumes" I do not get the point, cf video. Really? been playing since NA release and never heard of anyone killing the mutants. AutoHotkey scripts are now being caught as "suspicious programs" and the game shuts down after the last patch?! This is depressing me now to no end if Pearl Abyss really decided to block AutoHotkey. I was using AutoHotkey to turn my useless (and close to gaming hand) CAPS Lock key to a Ctrl key, so I can use it in-game without turning my letters into all caps every time I try to use it! I was also using it to change my Tab key to a Backspace key, as I delete things I type a lot, and discovered that a closer Backspace key is more efficient and comfortable for me. If I type anything in-game, I'm used to be able to delete (backspace) it using the Tab key, which I also use (as Backspace) as a shortcut or keybinding for my game! You are now blocking me from using a legitimate tool that I've been using for YEARS and gotten so used to. I'm so angry and at the same time sad that I feel like quitting. Why would you do such a thing?! How exactly was AutoHotkey hurting anyone?! It's okay, the information was split up into several chunks in the patch notes.